Marfan syndrome is a heritable condition that affects the connective tissue which typically manifests typically featured with the presence of rather remarkable body characteristics. But many people with this disorder are not aware of having it, while they are at risk for an aortic rupture (due to too much stress on the aorta), which is usually fatal. Therefore I have written an introduction about the hand in Marfan syndrome. About 1 in 3000 persons is known to have Marfan syndrome, but there are estimates which indicate that the true numbers could approach 1 in 1500 persons (because in many people Marfan syndrome has not yet been diagnosed). Some fascinating typical hand characteristics in Marfan disorder (involving multiple perspectives of the hands) are e.g. : long slender finger, hypermobility, hyperextensible skin, high positioned axial triradius, extra horizontal transverse creases on the fingers & in a significiant minority a simian crease can be found. Fascinating- I was wondering if there are any psychological characteristics that you have observed- perhaps consistent with water hands, or with observations of hyper-flexibility? those references were very helpful, also on the web it is fascinating to see that many teenagers and older people with Marfan have videos on You tube- and how they communicate through dance... this is a wonderful outlet for them I feel, and I love the courageous way they express themselves. I was wondering if one of these people could be approached by a professional such as yourself and asked whether they would mind sharing their feelings, their hopes, their fears, their likes etc. I wonder now, whether some models, who people stereotype as having eating disorders, may be living with Marfan syndrome- potentially undiagnosed. They are so tall and many seem slightly similar to those on videos. I also was particularly interested in the high positioning of the triaxial radii, as this was observed in the photos on a child's hand in a recent post. I have found this can represent a problem with the heart, valves or aorta. But , a friend who had such a highly placed axial triradii, a result of rheumatic fever, recently had undergone the repairing of the damaged valve and on taking his prints a year later the axial triradii had returned to a 'normal' position. I know changes can occur in skin ridge patterns- disassociation etc- but had not expected that the axial triraii would. I would be most interested in your observations and references. Felicity Martin wrote: I also was particularly interested in the high positioning of the triaxial radii, as this was observed in the photos on a child's hand in a recent post. I have found this can represent a problem with the heart, valves or aorta. But , a friend who had such a highly placed axial triradii, a result of rheumatic fever, recently had undergone the repairing of the damaged valve and on taking his prints a year later the axial triradii had returned to a 'normal' position. Did your friend's ridges become so broken up (i.e. string of pearls) and dotted that the triradius was no longer visible? It's supposed to be impossible for a triradius to relocate. Were you able to get prints? The 'high positioned axial triradius' is indeed a very significant clue regarding hands & heart problems - though it is often not a reliable indicator (because there is no direct relationship at all). So, just like regarding the example of the simian line & Down syndrome... one always has to consider the other aspects of the hand in order to evaluate whether the link could become significant for an individual. PS. People who have Down's syndrome (or other trisomy syndromes) are nearly always featured with a high positioned axial triradius, and about half of these people have an inborn heart problem. During the past year my 'Multi-Perspective Palm Reading' blog attracted many responses from people interested in Marfan syndrome. 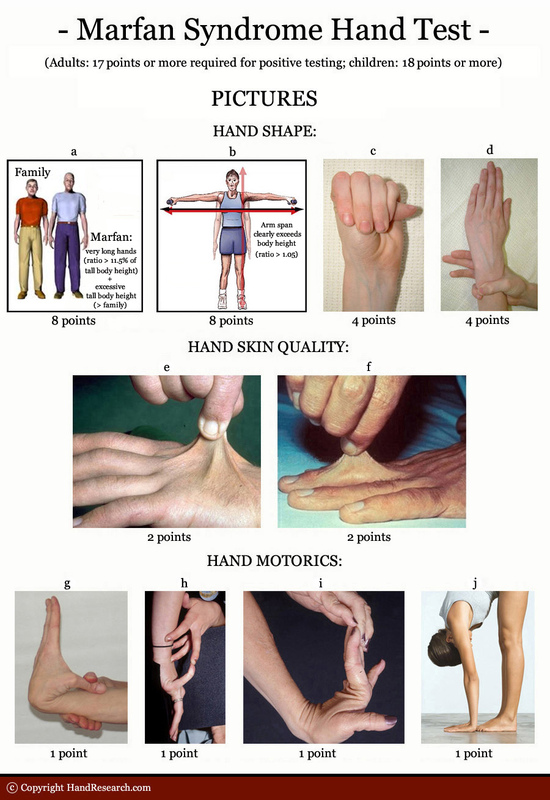 I hope this provides a better understanding of why a multi-perspective approach towards the hand is necessary for finding reliable results, and a better understanding of what type of hand characteristic combinations makes the hand in Marfan people unique compared to the hands of non-Marfan people. PS. Beyond this brand new test, I have featured this page also with some famous hand examples of Marfan people (including impressions & hand analyses of the famous Italian violinist Niccolò Paganini and the famous Russian pianist Sergei Rachmaninoff). Because long (thin) fingers combined with arm span longer than the typically tall (slender) body height [with a ratio > 1.05] is another key-factor which nearly always discriminates Marfan syndrome from the other related syndromes (including the so-called Ehler-Danos syndrome, which used to be known as Marfan type 2 syndrome until it became re-discovered only a few years ago). The 'arm span sign' (which e.g. reflects hand length) is now included in this test as a 9th key-sign for Marfan syndrome (introduced in the test as item 'c'). PS. This essential change results in a much higher correlation with the so-called 'systemic score for Marfan syndrome' (which is included in the 6th rule of the 'Ghent nosology' - that is since 2010 a.k.a. the official set of rules to be used for making a diagnosis for Marfan syndrome). Could you tell by just looking at a pair of hands if their owners had Marfan's? Also, would an exceptionally tall thin woman, over 6', with radial loops on ring and little finger of right hand be a candidate? Regarding your first question: yes, I think so - though I would need to have the person in front of my in order to see if the owner is able to make the signs included in the hand-test, etc. 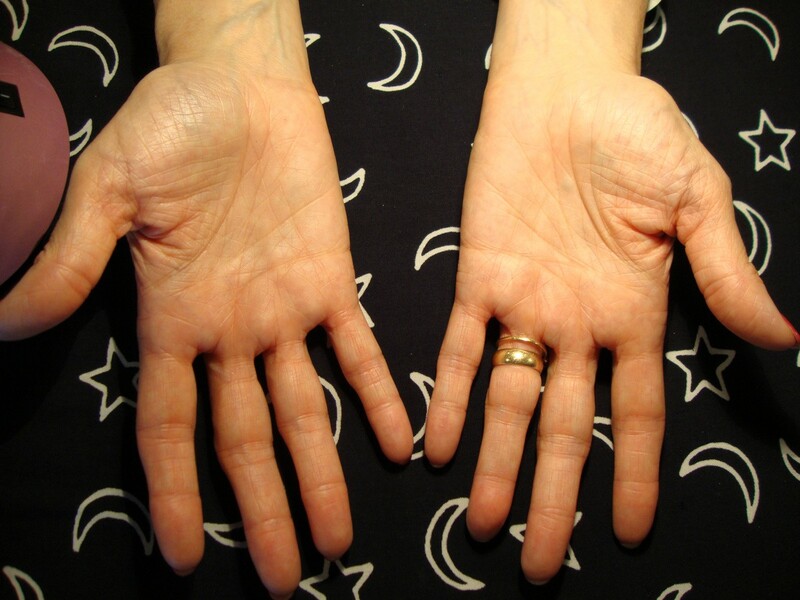 Regarding your second question: my answer would be that in Marfan syndrome the fingerprints probably reveal very little info (palmar dermatoglyphics appear to be involved much more but it is not easy to describe how). Regarding the length of this woman, I guess it would be essential to know whether her length exceeds the length of family members (including the males!?)... if so that could become a ground to proceed. However, from your input so far this woman has a higher chance for turning out to be a (wannabee) supermodel... or maybe a young woman with an eating disorder? Thus, so far I would say: likely not a 'candidate' - because the combination that you described includes not enough clues to validate the possibility for Marfan syndrome. Probably you can't help here then. I first read the granddaughter, about 11 or 12, who was of normal height and round in shape. I had noticed the tall lady in the crowd in the back ground. The grand daughter had the most unusual 'missing C' I've ever seen and asked to take photos. She was so excited about her reading that she told her grandmother who turned out to be the tall lady. I was excited to compare the dgs and take her photos, too. She has a loop in the same place as the odd ridges were in the granddaughter's palm, which explained somewhat the differences. I may have read another granddaughter as I asked to take photos of a girl with a comb pattern between the middle and ring fingers, missing C and B is almost not there... it took zooming in on the image on my monitor to see it. I originally thought both C and B were missing. There were similarities between the two girls. The grandmother has many extra creases and deep ones even on the distal tips, which I don't usually see except for thumb. Radial loops on ring and little on right and radial peacock on ring on the left. She looked healthy just taller than usual and slender. Yes, I agree Patti: I might not be able to help you out here... except by pointing out that what you described for the lady's hands does not include any clue at all that could point in the direction of Marfan syndrome. Maybe it was just the Lady's slender body height that made you think of Marfan? Additionally, the article now presents a list of 8 other hand signs that are significant for recognizing Marfan syndrome. 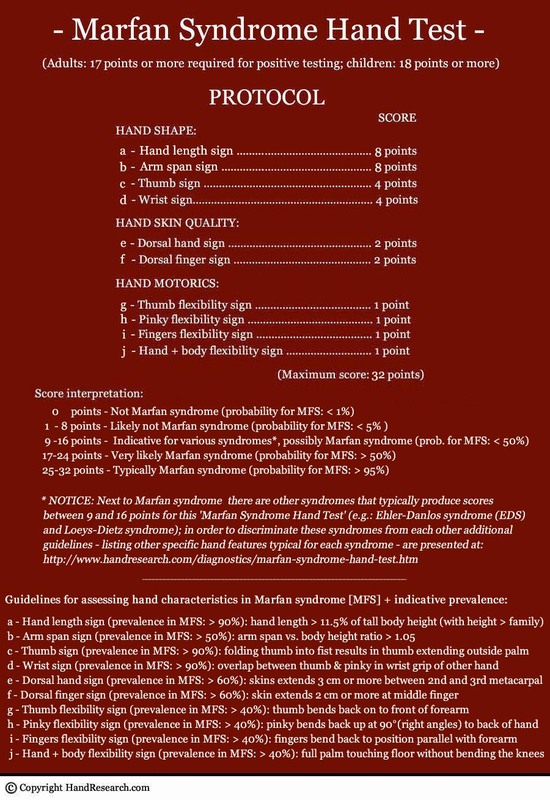 The hand test works pretty well for those who have Marfan syndrome: 6 out of 8 Marfan people directly passed the test (all with scores 24 or higher); 2 Marfan people arrived in the 'borderline category' (11 points and 16 points), but an analyses of the scores involved indicates that scoring points for the 'arm span' (or the former 1.03 ratio criterium) is a key-factor: one of these 2 Marfan people passed the 1.05 ratio and the other person does qualify for the 1.03 ratio (and has body height exceeding family members). NOTICE: So far two EDS people have performed the hand test as well: both score in the 'borderline category' (9 points and 10 points), however both do not qualify for the 'arm span sign' and both also do not have excessive body height. Finally one person who was diagnosed for LDS (type 2b - previously known as Marfan syndrome type 2) did the revised hand test and passed it as well - however, interestingly, this person was diagnosed as Marfan syndrome (before LDS was discovered in 2006). Therefore so far all feedback indicates that the hand test does discriminate Marfan syndrome [MFS] from Ehler-Denos syndrom [EDS]. Regarding Loeys-Dietz syndrome, I am confident that in far most cases the hand test will not result in a positive score for Marfan syndrome, however there is a considerable chance that a significant percentage of the people who have the LDS-type 2b variant might pass the Marfan syndrome hand test (which implicates that the LDS-type 2b group has a significant risk for getting a 'false positive score' on this hand test). I think this is pretty fascinating." In the literature about Marfan syndrome 'spider fingers' (a.k.a. arachnodactly - which means: long slender fingers) are described as a key-feature in Marfan syndrome. However, my study of the hand in Marfan syndrome made me realize that this typical feature has not been described very well - because so far there has been no 'hard' criteria for discriminating arachnodactyly from normal fingers. The picture below describes precisely how to recognize 'abnormal long fingers' (technically scientists call it 'dolichodactyly') in Marfan syndrome. 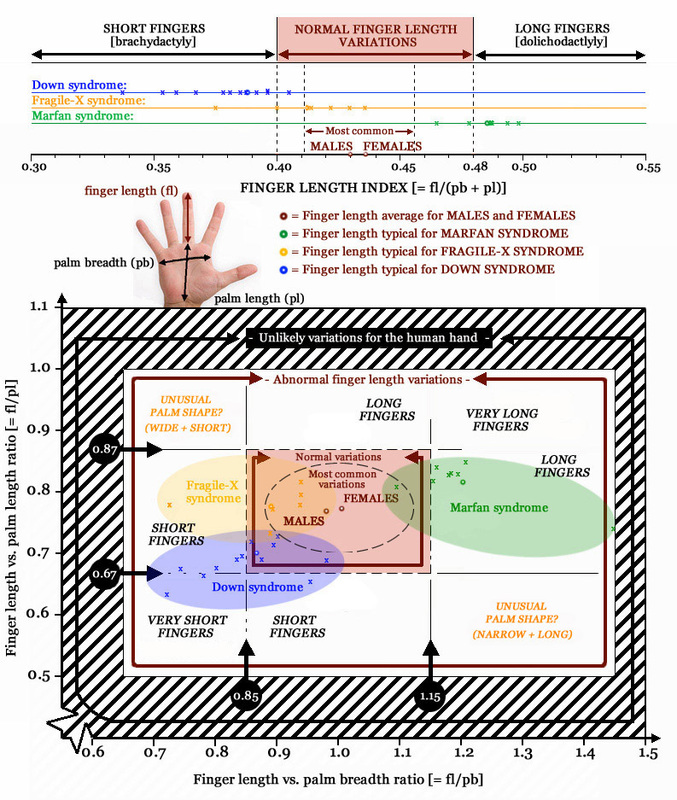 Because in Marfan syndrome finger length only presents an atypical feature when finger length is compared to the breadth (palm) of the palm... but not when finger length is compared to the length of the palm! PS. I should add here that in Marfan syndrome the ratio between finger length and palm length will usually turn out to be slightly higher than the international average for men and women (see the picture below: 7 out 8 Marfan hands score above average on the 'finger length / palm length' dimension - but still within the 'normal range'... only on the 'finger length / palm breadth' dimension the scores are beyond the 'normal range'). 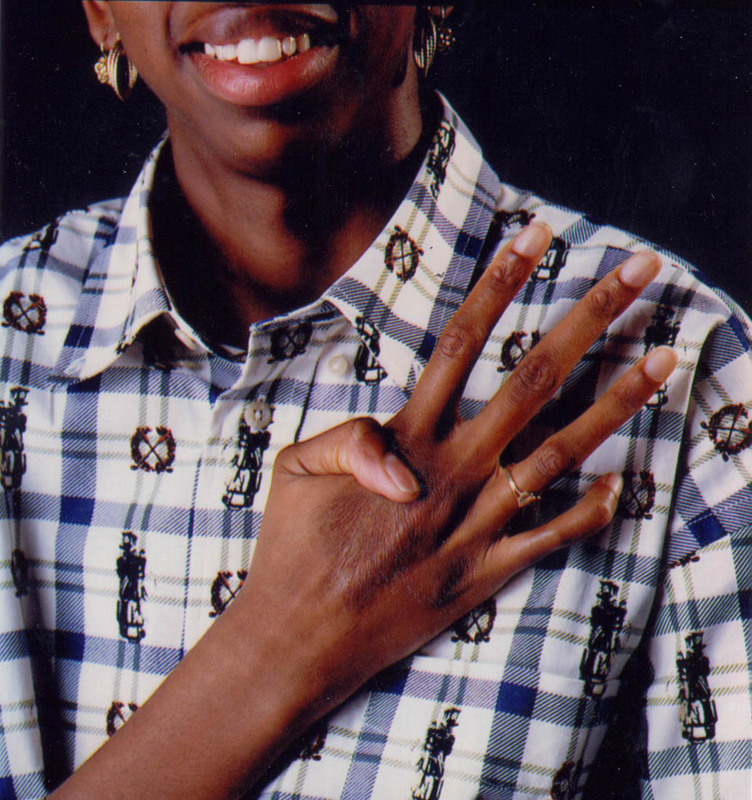 EDIT: Picture has now been updated with the 'finger length index': 6 out of 8 Marfan hands have abnormally long fingers (= dolichodactyly). Martijn, where did you come across the term olichodactyly? I can't find any reference to it on the internet (apart from where you have written it). Closest word I found was oligodactyly (fewer than 5 fingers or toes on a hand or foot). Thanks Lynn... I somewhere lost the first letter of the word, I have corrected the error - the word is now correctly written as: 'dolichodactyly'. How would you classify these? I have close ups of palms and fingers if you need to double check anything. p.s. : I realize you can't get actual measurements, but I thought you would be able to get ratios. The photo gives me the impression that this person's finger length is clearly above the international average (both hands), with the right hand (displayed at the left) very close the category (abnormal) 'long fingers' in the perspective of palm length. However, I should add here that due to the camera position I expect that the fingers are actually slightly shorter (and the palm slightly longer) than seen in this photo. PS. Just wondering why you posted this photo in the Marfan topic... can this person any how be connected with Marfan syndrome?